VOLNEY – Several Volney Elementary School students were recently highlighted for achieving success in their classroom, either academically, socially or behaviorally throughout the month of September. Volney Elementary “On a Roll” honorees proudly display their certificates, presented by Principal Todd Terpening, top left. Nominated by their teacher, 19 students received an “On a Roll” certificate from Principal Todd Terpening during a school assembly because they worked hard toward a goal. Honorees include Layla VanLinder, Parker Hicks, Jack Munger, Anthony Finch, Caden Torelly-Smith, Marcus Collar, Noah Schumacher, Collin Denson, Lila Thurlow, Rachel Acker, Payton McGuire, Jose Vosseller, Jacob Polly, Holly Cornell, Elijah Hamlton, James DeCare, Ava Ditton, Noah O’Banner and RJ Nash. Terpening then presented another group of students with the monthly classroom role model awards. 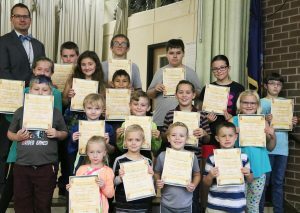 Students who were honored because they exhibited curious abilities each show off their Principal’s Award, given to them during a recent assembly by Volney Elementary Principal Todd Terpening, second from left at top. For September, several students were recognized for their curious abilities. Because of their efforts, Terpening said they have made Volney a better place to learn. 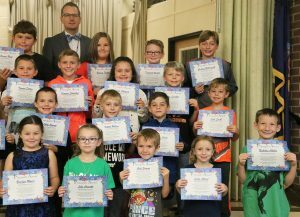 He presented Principal’s Awards to the following students: Braelyn Myers, Lila Crisalli, Colt Ermini, Laila Allard, Nick Childs, Seth Smith, Colton Ilardi, Cody Smart, Cadie Shepard, Dylan Bigelow, Nate LaBeef, Tanner Ditton, Keagan Shortslef, Odynn Wilson, Zackery McDougall, Conner Rowe, Aden Lavallee, Gianna Tucker, Deverick Reidell and Nick Simmons.